I'm sort of going to defend the ridiculous ending season finale of AMC's The Killing...and I'm sort of not. 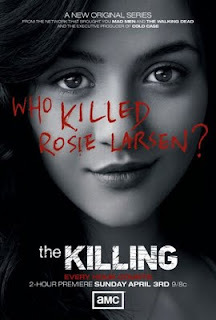 Last Sunday's episode was, in theory, supposed to answer the question posed at the beginning of the series, "Who killed Rosie Larsen?" As viewers of the show know, this question was not answered at the end of the episode. This move angered fans and critics. It angered me, too. But let's back up a bit before getting to the ending. In the pre-season hype for The Killing, many made the comparison between it and David Lynch's Twin Peaks from the early 1990s. Superficially, of course, I could see why. Both shows center around the murder of a teenage girl, and both are set in the Northwest. Both shows deal with the impact of the murder on the victim's family, and both follow the investigation into the murder. Besides that, the two are nothing alike. Twin Peaks was set in a small town, The Killing in a large city. The investigator in Twin Peaks was from the FBI, while in The Killing, it was city detectives. Twin Peaks was not, in any way, tied to a particular time. The Killing was very 21st century (i.e. the possible terrorism connection to one of the initial suspects). With Twin Peaks, a key ingredient of the show was the unorthodox methodology of Special Agent Dale Cooper; while in The Killing, the investigation is pretty much boiler plate detective show stuff. Thankfully, neither show focused on forensics and autopsies too extensively (an obsession in modern day detective/police shows and one that I am tired of). But the anger about The Killing is not about its superficial similarities with Twin Peaks. 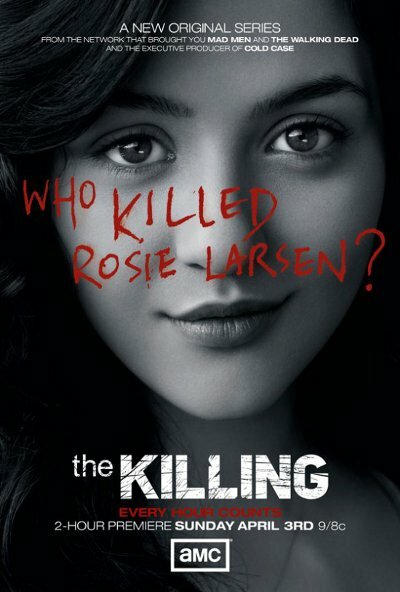 The anger is about how the The Killing ended its season without revealing who the hell killed Rose Larsen. They led the viewer to believe the investigation was wrapped up - that the cops got their man. They spent the better part of the season finale crossing all the T's and dotting all the I's for their arrest of Councilman Richmond, the wealthy, widowed member of the Seattle City Council who was poised to be the next Mayor. (SPOILER ALERT) But, then, at the very last second, we find out that the final piece of evidence used to secure the arrest was doctored, and that Detective Linden's shady partner was involved. He is seen talking to someone off camera relaying information about Richmond's imminent arrest. The final scene shows Larsen family friend, Balko (who I guessed would be the killer, but I was wrong), shooting Richmond as he was being walked in to be arrested. BAM. No resolution, and now there is a cliffhanger to next season. Weak...but typical. But Twin Peaks fans should remember that it, too, did not resolve the show's murder at the end of the first season. In 1990, the country was abuzz with wonder over "Who killed Laura Palmer?" But season one ended without resolution of that murder, either. It wasn't until about a quarter of the way through the second (and final) season of the show that the killer was revealed. After that, the show went in a different direction, lost most of its viewers, and ended unceremoniously. For the record, I liked the second season and where the show went. I was also upset that when a Twin Peaks film was made, it was a prequel as opposed to following the story to its ending. Prequels are stupid, especially with a murder mystery. So, this is my long-winded way of saying that although the end of the season of The Killing was a disappointment, let's keep things in perspective. It's just a TV show, and it's better than the 30th season of CSI. Calm down, folks. Hey, it didn't bother me. I thought it was a neat twist that once again the cops (or at least the woman) had caused a wrongful death. My only complaint about the show is they're really going overboard with the rain. It's grey here a lot but it rarely rains that hard.